Do you have your Halloween costume ready? It’s T minus 3 days to trick or treaters. What about Frankenstein, or a mummy or dracula? 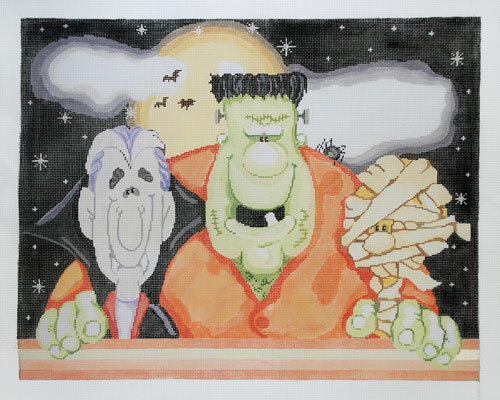 OK, so we aren’t really dressing up for Halloween but we could stitch for it. While Brenda Hart was at the shop a few weeks ago she stitchguided this awesome Shelly Comiskey canvas. Love it! 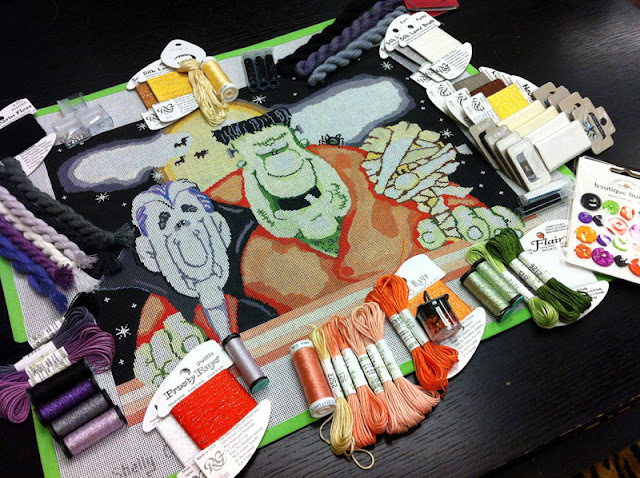 We typed up the stitchguide so that all our Halloween-loving friends could have it with their canvases. The stitches are super fun. This is the cutest Halloween project I've ever seen!!!! this canvas is awesome. it makes me want to stitch it. Durn,you just keep trying to get me!!! Love this canvas. How much for canvas and guide? Thanks! Thank you for choosing River Silks silk ribbon! I can't wait to see the finished piece!